AccountEdge offers full-featured accounting software for your small business, on the desktop. With no monthly subscription, it helps you run and report on all aspects of your business: sales and invoicing, purchases, payroll, inventory, time billing, and more. The software’s double-entry system means your accountant will be glad when it’s time to peruse your file (especially because the vendor gives them a free copy). AccountEdge helps you run and report on all areas of your business: time billing, inventory, purchases and orders, and sales and invoicing, and more. You can also add payroll forms, direct deposit, credit cards, and many more services. The vendor offers excellent service and you can visit their website’s support page to avail free email support and make use of self-help resources like a knowledge base, support library, and discussion forum. Their phone support team is based in their offices in Rockaway, NJ. You can also search for local help from one of AccountEdge’s Certified Consultants. Profitability. New Profitability reports show the profitability of items, customers and activities. Get Paid Online. Web Pay lets you email invoices containing a payment link, allowing customers to pay you online. Purge Quotes. Purge quotes and lead records that didn’t convert to sales and are no longer needed. Serialized Inventory. Resellers, manufacturers, wholesalers, and other item-based businesses can track serial numbers from purchase through sale, and beyond with warranty tracking. Commission Tracking. Choose a fixed percentage or amount as a commission, or create a custom rate per item or per activity. Assign commission rates by salesperson and choose whether to pay commissions based on sale date or payment. Returns and Credit Memos. 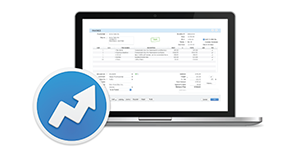 Create a credit memo from an existing sales invoice or as a new sales transaction type. Also sync them from Shopify to settle them in AccountEdge. Include additional charges or fees, should be added as a negative number when using the credit memo. Historical Reports. Start building seven years of Profit and Loss reports and Balance Sheets. A new Multi-Year Spreadsheet report displays year–over–year comparisons in columns. Advanced Filtering. Use advanced filters to search the Bank Register and the Sales and Purchases Registers. Since each enterprise has specific business requirements, it is advisable for them to refrain from searching for a one-size-fits-all ideal software solution. Needless to say, it would be pointless to try to find such a system even among popular software platforms. The intelligent thing to do would be to catalog the various important elements that require consideration such as key features, budget, skill levels of workers, company size etc. Then, you should do your research thoroughly. Read some AccountEdge reviews and look into each of the other apps in your shortlist in detail. Such in-depth groundwork can make certain you reject ill-fitting systems and choose the solution that offers all the elements you need for business success. How Much Does AccountEdge Cost? AccountEdge Pro is available for $499 for a new user. Optional upgrades are available for $359 single-user upgrade and $399 for multi-user/Network Edition upgrades. There is also a great 30-day free trial of AccountEdge available that lets you try out all the key features of their service. We realize that when you make a decision to buy Accounting Software it’s important not only to see how experts evaluate it in their reviews, but also to find out if the real people and companies that buy it are actually satisfied with the product. That’s why we’ve created our behavior-based Customer Satisfaction Algorithm™ that gathers customer reviews, comments and AccountEdge reviews across a wide range of social media sites. The data is then presented in an easy to digest form showing how many people had positive and negative experience with AccountEdge. With that information at hand you should be equipped to make an informed buying decision that you won’t regret. What are AccountEdge pricing details? What integrations are available for AccountEdge? Pros: I love that the software is simple to set up and intuitive to use. I use it to keep track of my receivables and payables. I can assign job numbers to projects and code invoices to the job. When I invoice my client I can view the expenses made against the job and add mark-ups as needed before billing. The app also makes it simple to reconcile my bank statements. Cons: I wish I could separate personal details from business details. I use Quicken to manage my personal accounts. There should be an option to open a personal account within this system. Maybe the option is available and I’m not aware of it. Pros: For me the biggest benefit was I just needed a few hours to learn the essential features of the software that my company required. Cons: A couple of minor drawbacks: First, memos on checks written in this system feature in a different way on the bank register compared to memos on deposits. Second, it is somewhat hard to reverse a transaction. For me the biggest benefit was I just needed a few hours to learn the essential features of the software that my company required. If you need more information about AccountEdge or you simply have a question let us know what you need and we’ll forward your request directly to the vendor.